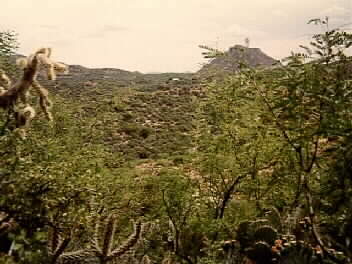 This is a long-distance view of Cane Creek in the Dripping Springs Mountains, just south of the Pinal Mountains near Globe. (A MOST difficult place to get to!) It was at Cane Creek that Pearl Hart held up the stage in 1899 with Joe Boot. Pearl later was pardoned and then disappeared from history. She was America's last stagecoach robber--a woman.